First state of two, published in 1803. 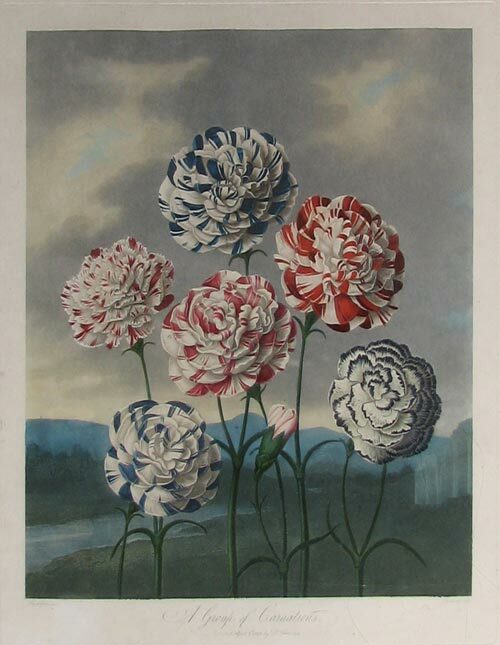 A magnificent, mixed method engraving by James Caldwall after the painting by P. Henderson and published in London in 1803, then subsequently reissued in 1807 as part of Dr. Robert Thornton’s The Temple of Flora. This plate, partly printed in colour, exhibits various methods of engraving such as aquatint, stipple and line and is from one of the most accomplished botanical works ever produced. All the plates were originally sold individually to subscribers and the complete 31 images did not appear together until they were collectively issued as The Temple of Flora in 1807. Dr. Robert Thornton was a lecturer on medical botany at both Guy’s and St. Thomas’s hospitals. He published many of his own works including the “New Illustration of the Sexual System of Linnaeus” which culminated in the magnificent volume of colour plates entitled The Temple of Flora. Thornton devoted his modest fortune to this publication, which he vowed would be the most magnificent botanical work ever produced. The resultant plates are quite breathtaking: colour printed mezzotints and stipple engravings depicting both familiar and unusual plants set against romantic landscapes. Sadly, the expense involved in producing the Temple of Flora reduced Thornton to bankruptcy as he relied upon subscriptions that were not forthcoming. In an attempt to recoup some of his losses he published a smaller edition of the work and arranged a ‘lottery’ for 6th May 1813 at which the original paintings were offered as prizes. Unfortunately the lottery was also under subscribed and, despite his affluent past, Thornton died penniless in 1837. He left behind what is arguably the finest botanical work ever to be printed in England.